‘The Learner’s Pocketbook’, writes Tony Buzan in his foreword, ‘is a considered and intelligent introduction to this intriguing field, and will start the ‘learner of learning’ off in the right direction’. It encourages individuals to take responsibility for their own learning, and explains how they can harness their brain power so as not to hinder the learning process. This book can be used in preparation for any type of learning and makes ideal pre-course material. It covers brain power, learning theory, planning and committing, intelligence styles and techniques – all in the highly visual, approachable Pocketbooks style. One of our customers, a leading financial services company, uses this Pocketbook to support the training of new staff who have taken up their posts as a second career move and who have been away from the learning environment for some time. 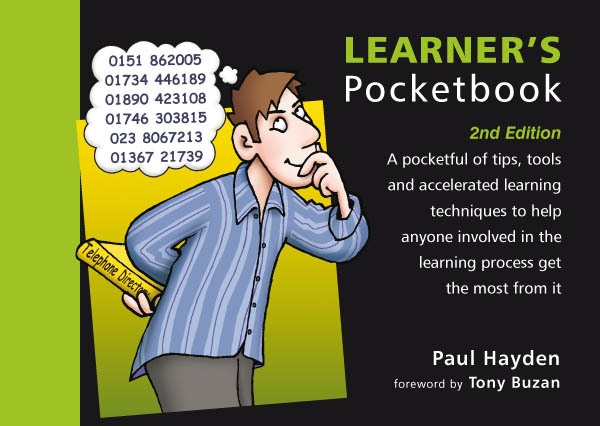 The Learner’s Pocketbook helps in this refresher process.